MMF Industries Expandable Dark Green Transit Sack, 14w x 11h x 3d - Reusable, long-lasting mail bag is made of postage-saving, lightweight, abrasion-resistant, wear-resistant three-ply nylon bonded to cotton cloth. Ideal for sending bulk mail, samples, office supplies or small parcels. The zipper closure keeps contents secure in transit and can be combined with a combination lock or a security seal that loops through the zipper to ensure the mail remains confidential. Expandable sides allow easy shipment of three dimensional items. The mail bag is U.S. Postal System approved. 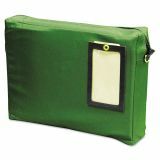 A see-through window on the bag's small front pocket is perfect for a shipping information, business card or company identification. Imprint area is 7 wide x 7" high."